The high bitter component of wormwood stimulates the secretion of digestive enzymes, thereby improving the appetite and increasing the efficiency of food digestion and absorption. It can also help to alleviate nausea, travel sickness, flatulence and reduce bloating. The sesquiterpene component of the herb is strongly insecticidal and may be used as an insect repellent. 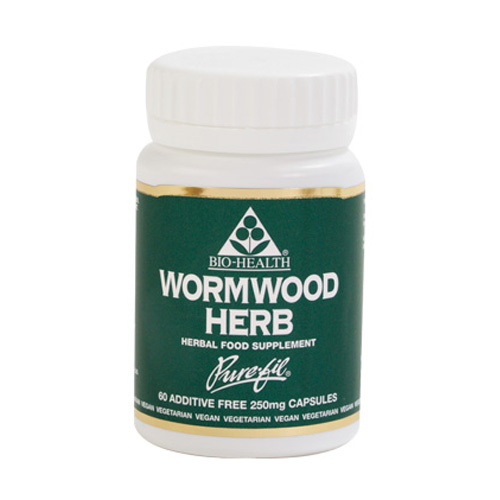 As its name suggests, Wormwood is an effective treatment for intestinal worms and other micro-organisms. Wormwood is a perennial shrub growing up to three feet tall. It is a native of temperate regions of Europe and North Africa. The leaves are used medicinally. It`s active constituents include sesquiterpene lactones, volatile oil, phenolic acids and tannins. Wormwood contains a high thujone component so should not be taken for longer than four weeks at a time. Do not take during pregnancy or lactation. Take 1-2 capsules with 150ml of water, three times a day. Below are reviews of Wormwood Herb - 60 Capsules by bodykind customers. If you have tried this product we'd love to hear what you think so please leave a review.